Peanut covered, glazed sponge like cake that has been a family Christmas tradition of my husband's family for many generations. Sift the flour, sugar and b. powder 7 times, combine with the 1 cup boiling water. Let cool while beating the egg whites stiff. Fold into flour mixture. Grease and flour your pan. Can be baked in 9x 13 pan if so bake 35 minutes at 350 F. degrees. Let cool then cut into 1 1/2" squares. If you wish bake in cookie sheet and adjust accordingly. But make sure to cut your pieces small as they grow as you roll in the nuts and glaze. Freeze so it is easier to handle. Melt the butter in the hot water, add powdered sugar. Dip your cake squares in the glaze lightly drag on the edge of your pan to remove excess glaze then roll in the ground peanuts. Keep where it is cool. I have to hide ours or they are gone before Christmas. Source: My wonderful late Mother-in-law Marcella, love you Mom. Oh, My goodness. What a surprise when I saw someone else with a recipe for Blarney Stones. I too make them but I usually make them at St. Patricks day. My cousin makes them at Christmas and always sends me a few. I made these a few days ago and think they're great! I like lots of peanuts on them (one lb. was not enough to cover all my cakes, so next time, I'll get 2 lbs. 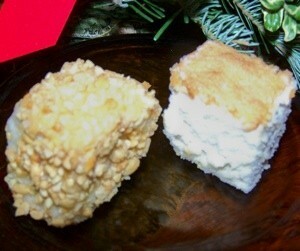 of dry-roasted nuts and I'm going to cut the cake into 1 inch cubes). I also found that keeping the glaze warm (heating up as necessary) is helpful. Thanks so much for the recipe! !